Temporomandihular Joint or TMJ is not just one disorder but several disorders that affect the jaw joint and the muscles that control chewing. The pain associated with TMJ can be minor such as clicking or popping sensations when the mouth is opened or closed, or as serious as chronic pain into the face, neck and shoulders. Discomfort from TMJ is mostly occasional and not permanent. The pain tends to eventually go away with little or no treatment. X-rays of your teeth and jaw can help determine if your problem is dental related. If it is, procedures can be done to improve the alignment of your bite. This may include the addition of crowns or reforming of tooth surfaces. Because other types of pain have been known to mimic a TMJ disorder, complete dental and medical exams are important steps in getting an accurate diagnosis. 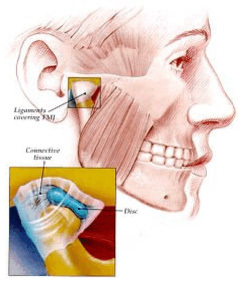 There are several treatment options with TMJ that can he done in our office. Custom-made splints are one way of correcting the disorder. In rare cases, surgery is required to correct the disorder. Surgery is generally considered only after all other forms of treatment have been exhausted. Early detection is the key to eliminating the symptoms of TMJ. Many health care professionals, especially dentists, keep up with the latest research and techniques for relieving TMJ symptoms. If you suspect you may have TMJ, your first stop should be your dentist's office.